Retractable banner stands are easy to assemble with options to fit any budget! 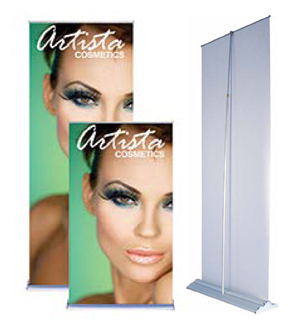 Retractable banner stands, also called roll up or popup banner stands, are one of the most popular portable displays. They can be set up in minutes, easy to store, and come with a carrying case. To assemble, place the base on the ground, assemble the telescopic pole, pull up the graphic and affix to the pole. Compared with other options for portable displays, retractable banner stands can be relatively inexpensive. We offer retractable banner stands to fit any budget with many sizes to choose from. 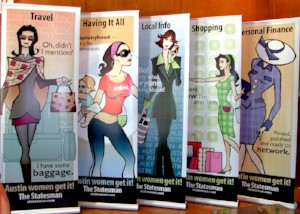 Take a look at our Banner Stand Portfolio here. Designed to be durable, stylish and reusable. Graphics are easily changeable due to the hook and loop attachment on the canvas leader. Comes with a telescopic pole and padded bag. Widths: 24", 36", 48", 60"
Height for 24": 85" to 92"
Height for 36-60": 69" to 92"
Same great design as the standard Silverstep with a shorter pole. Height for 24" width: 45", 54", 63", 76"
Height for 36"-60" widths: 36" to 59"
The Doublestep banner stand displays two banners back to back and is easily portable in its foam-padded carry bag. 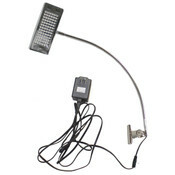 Widths available: 24" and 36"
This LED light clamps on to the top of the pole to illuminate the banner. Watch the video below to see how to set up the Silverstep banner stand.